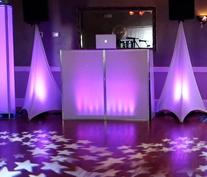 Join us at one of our Monthly DJ Showcases - You can See our Entertainers Perform , Experience Special Effect Lighting Displays, Have Fun in our Photo Booth, Photo and Video Displays and get Great Ideas & Planning tips for your Event . Find all your wedding day needs in one easy stop! Runway fashion shows, exhibits, seminars and great prize giveaways. Attend a show to be eligible to win the grand prize - DJ, photo booth, officiant, limo, tuxedos, hotel suite and an all-inclusive Sandals vacation valued at over $8000.00! Check out our DJs live, ENTERTAINING THE CROWD AS THEY SPIN THE LATEST & GREATEST at South Jersey and Philadelphia area hotspots including Collingswood, Oaklyn, Maple Shade, Deptford, Gloucester City AND Pennsauken. GOBOs are a great way to add a personal touch to your event. 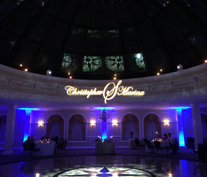 Choose a font and artwork and we can display your custom design on the dance floor or wall. 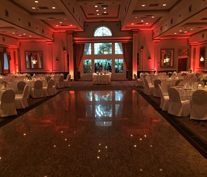 Uplighting gives you the ability to accent your room and reflect your personal color palette throughout your event space. You choose your color and we'll place lighting strategically around your room to make it your own. Want a "club-like" atmosphere for your event? Add an intelligent lighting package to your event and bring the nightclub to your party.